Our pals Fiona and Kerry stopped by to visit with us a couple of weeks ago. They were on their way back to the States after backpacking through Asia for five months. 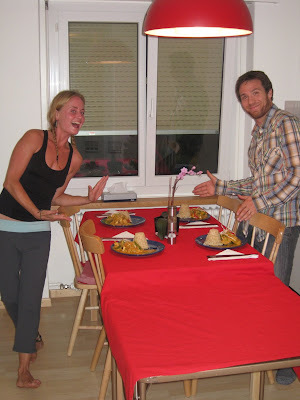 Before coming to Switzerland, they had been traveling in India for a month, quite literally partaking in delicious feasts for a whopping fifty cents. As I rode the train to meet up with them in Zürich, I tried rehearsing what I might say to break the news to them that they would be in for a bit of sticker shock. "So, about that whole living off of $8 a day, not gonna happen here." Luckily, they had no need to worry about us showing them the fancy restaurants in the area or taking them to ride expensive cable cars. Since none of us had neither disposable cash nor a train pass, we had to find fun in other ways. 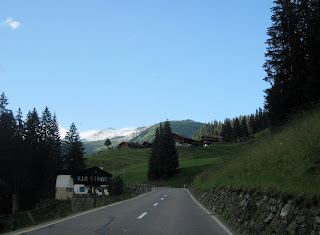 Here I will highlight how we entertained ourselves for six days: on foot, by bus, and by car. 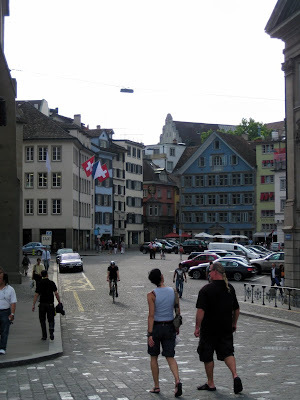 Wander around Zürich on foot. No map, no set destinations. I'm not much of a tour guide, since I don't live in or near Zürich, but I did manage to lead our pals on a stroll down Bahnhofstrasse, for a dip in the lake (just our feet along the Utoquai), and for a glimpse of the Marc Chagall stained glass windows at Fraumünster. For the time being, I'm a "local." So, I did what I normally do: ride the Ostwind bus. Two days in a row, we bought day passes that allowed us to freely ride between two zones in the Ostwind system. One day we visited the Salvation Army, newly relocated to Altstätten, wandered around the old town, had a coffee and cake break, and did some shopping at Coop in Heerbrugg. The next day we went to the beach (Strandbad Chf 4/person) in Staad (packed lunch - leftovers from dinner) and shopping at Rheinpark. Take advantage of locally grown produce by making dinner at home every night. Three nights in a row, we took turns making dinner. The girls had the opportunity to support local producers by cooking with products featuring the Aus der Region/Für die Region label. Our menus included ricotta stuffed roasted tomatoes, pasta primavera, and veggie/tofu curry (photo below). We even got to use the chopsticks that Fiona brought us as souvenirs from her trip! There is only so much to do in and around our area, so by the weekend, it was time to go on a little road trip. We indulged our friends a bit and stopped in Liechtenstein so they could check it off their list. 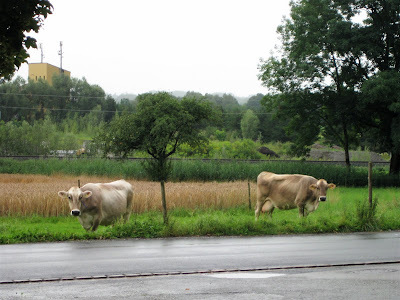 Below - genuine Liechtensteiner cows. 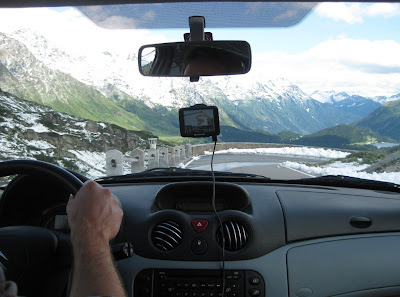 Heavy rain in Au on Friday meant snow in San Bernardino, which made for a lovely scenic drive through the Alps. Yes, we took the long way. 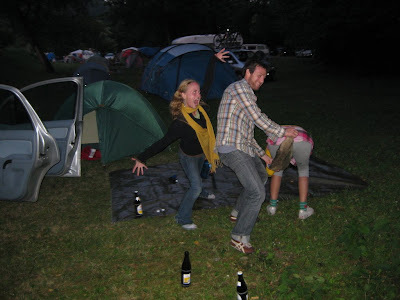 I am a huge proponent of the camping experience. I wasn't always this way, but our past few experiences have been very positive and I am looking forward to our next camping trip. We stayed at Campeggio Zandone, situated along the Melezza River in Losone. 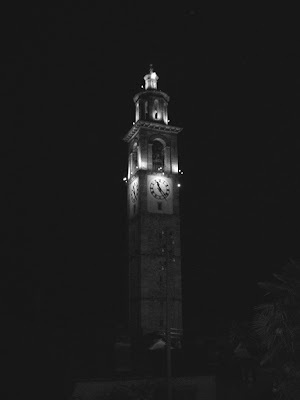 Compared to Campofelice in Tenero (click here for a post related to our stay there) and nearby Campeggio Lido Mappo (our first choice over Campofelice because they offer free ferry service to Locarno), Zandone is not exactly the five-star camping experience. It is much more rugged and free-spirited with lots of families, people drinking (and offering) beer, and open plots (that is, no assigned spaces and a casual registration process). But when you don't plan ahead, make no reservations, and get turned away from your first choice campsites directly on the Lake, you take what you can get. I'm not complaining, though, because we had a great time. We enjoyed leftover curry for dinner, heated on Isaiah's camping stove. 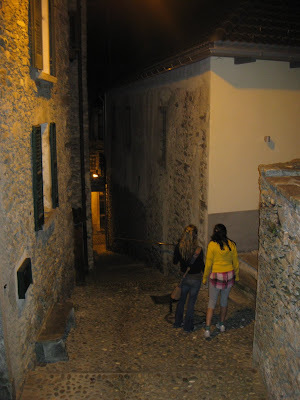 Had we not set up camp at Zandone, we never would have taken the night hike that led us to explore the medieval mountain village of Intragna. Relax at a public beach. With most beaches along the Bodensee charging a few francs just to lie on the grass, we were happy to discover a satisfactory public beach in Ascona called Grande Lido Ascona. If you just want to go for a dip in the lake and sunbathe on the beach, then this is the place to go and it's absolutely gratis. The only extra costs are for food and refreshments, a changing room, and the water slide. On our way to drop me off at language camp (as a teacher not a student! 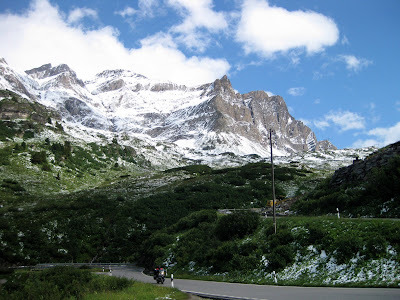 ), Fiona and Kerry kept thanking me for getting the job in Arosa because it allowed them to see this beautiful scenery on the winding road from Chur. All photos above are courtesy of Fiona O'Donnell. 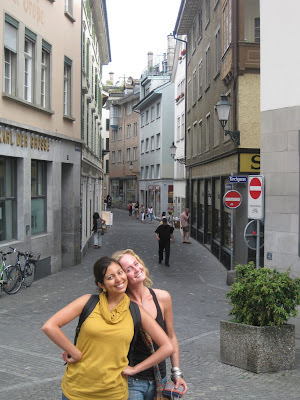 As it turns out, the most expensive thing we did with our friends was eat at a Mexican restaurant on Niederdorfstrasse in Zürich. (Isaiah drove in to pick us up, dine with us, and take us back to Au.) At a shocking CHF 30 per plate (average), we left with satisfied bellies, but wondered whether or not to consider the food we ate authentic Mexican cuisine. Thanks for spicing up our lives for a week, ladies! 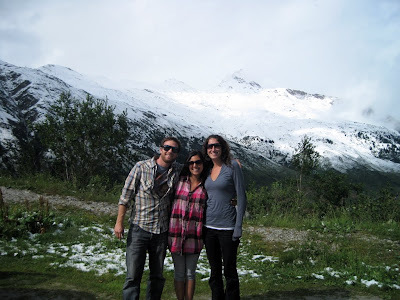 wow that is a great itinerary and all on a budget! impressive! Where is this salvation army in atstetten? I would love to visit it. Thanks! Thanks for the info on campsites. We haven't tried that yet and would love to. Thanks sooo much for posting something on camping. We're trying to find a good place to go for the weekend two weeks from now. I'm checking out Campofelice and Campeggio Lido Mappo. Got any other recommendations? I'm used to Canadian camping where you have much more privacy in a campsite than it seems you get here...but I suppose we have a bit more space in the Great White North. :P If you know of anything like this though, please let me know! Jessica - I am sorry for the confusion. 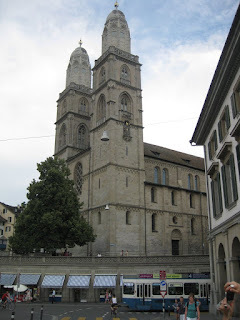 I believe Altstetten is in canton Zürich, but Altstätten is in canton St. Gallen. The Brocki is just a block away from the Altstätten main train station. Chantal - you're very welcome. I edited the post to include more links. I've previously written about our stay at Campofelice and we were very impressed - right on the lake. This last time we wanted to try Lido Mappo, which is also in Tenero and on the lake (Lago Maggiore), but lake camps fill up quickly! Zandone was our choice out of desperation. 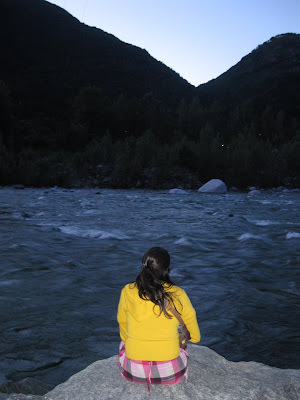 Like I mentioned in my post, it was on a river instead of the lake - but still offered a memorable experience. Gwenyth - Best of luck on your search! I don't know about any other camps down there except for the first hand experience with Campofelice and Zandone. Campofelice has designated and spacious plots, but there aren't any trees hiding you away from other campers. 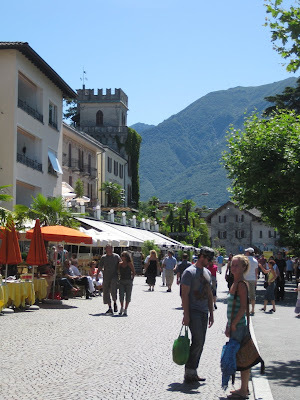 I will say that I think the campsites near Locarno (on Lago Maggiore) are much more attractive than the plentiful campsites in Agno, which is on Lake Lugano.